This is it for awhile! Our bout on May 5th is our final home bout until October! Sad, I know! Some come and join us! 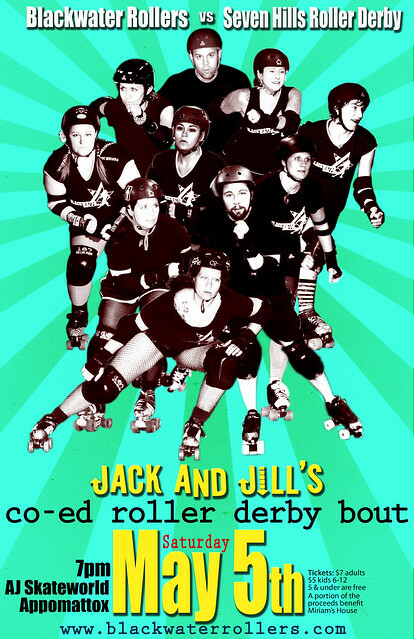 We are switching things up a bit this time and playing co-ed with the Seven Hills Roller Derby out of Richmond, Va. Same rules, just a little more testosterone thrown in there to spice things up. This is the first time we have added men to our roster on our home rink so take advantage of this special bout! You know the drill…. Saturday May 5th, 7pm, doors open at 6, AJ Skateworld, Appomattox. We will have a special half time performance from country music artist Nick Smith! For more information, consult the facebook event page. See you all there!